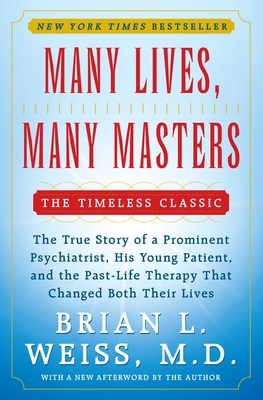 From author and psychotherapist Dr. Brian Weiss comes the classic bestseller on the true case of the past-life therapy that changed the lives of both the prominent psychiatrist and young patient involved—now featuring a new afterword by the author. As a traditional psychotherapist, Dr. Brian Weiss was astonished and skeptical when one of his patients began recalling past-life traumas that seemed to hold the key to her recurring nightmares and anxiety attacks. His skepticism was eroded, however, when she began to channel messages from the “space between lives,” which contained remarkable revelations about Dr. Weiss’ family and his dead son. Using past-life therapy, he was able to cure the patient and embark on a new, more meaningful phase of his own career. With more than one million copies in print, Many Lives, Many Masters is one of the breakthrough texts in alternative psychotherapy and remains as provocative and timeless as it was when first published. Brian L. Weiss, MD, a psychiatrist, lives and practices in Miami, Florida. He is a graduate of Columbia University and Yale Medical School and is the Chairman Emeritus of Psychiatry at the Mount Sinai Medical Center in Miami. Dr. Weiss maintains a private practice in Miami and conducts international seminars and experiential workshops as well as training programs for professionals. He is also the author of Through Time into Healing and Same Soul, Many Bodies. You can visit his website at BrianWeiss.com. Edith Fiore, Ph.D., clinical psychologist and author of You Have Been Here Before This thought-provoking, beautifully written book breaks through the barriers of conventional psychotherapy and presents an innovative and highly effective treatment. It should be taken seriously by those in the mental health profession. Richard Sutphen, author of Past Lives, Future Loves and You Were Born Again to Be Together A spellbinding case history substantiating the effectiveness of past-life therapy. The book will open doors for many who have never considered the validity of reincarnation. Jeanne Avery, author of Astrology and Your Past Lives A profoundly moving account of one man's unexpected spiritual awakening. This significantly courageous book has opened the door to a marriage between science and metaphysics. Must reading for a soul-searching, hungry world. Joel Rubinstein, M.D. former instructor of psychiatry at the Harvard Medical School now in private practice Dr. Weiss integrates concepts of traditional psychotherapy and the exploration of his patient's spiritual unconscious. My view of myself and others will never be quite the same. Andrew E. Slaby, M.D. Ph.D., M.P.H. Medical Director, Fair Oaks Hospital An interesting, well-written and thought-provoking exploration of the influence of past-life therapy on present behavior. You cannot put it down without feeling empathetic with Dr. Weiss's conclusions. Jeanne Avery author of Astrology and Your Past Lives A profoundly moving account of one man's unexpected spiritual awakening. This significantly courageous book has opened the door to a marriage between science and metaphysics. Must reading for a soul-searching, hungry world.